In full disclosure, we were hosted by Gaylord National Resort for a night’s stay in exchange for this review. Experience the architectural beauty of Gaylord National Resort! 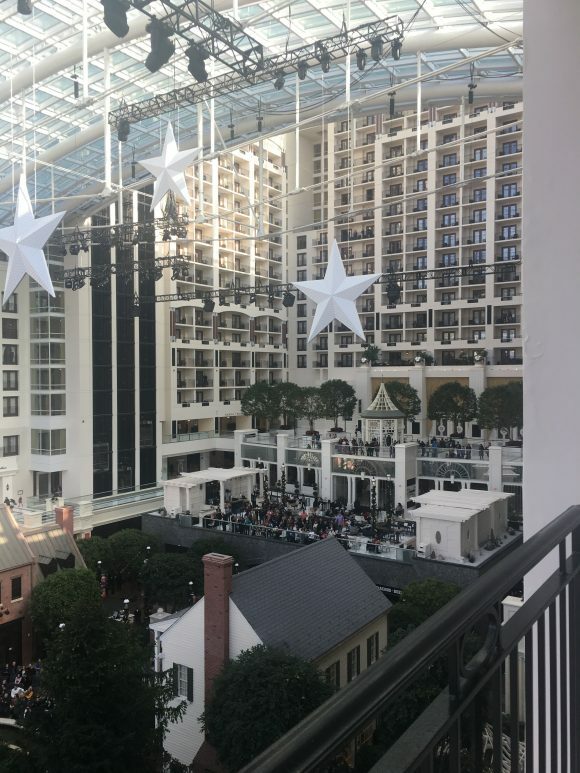 At the start of the holiday season, my family and I took a 3 1/2 hour drive to Gaylord National Resort for an overnight stay. 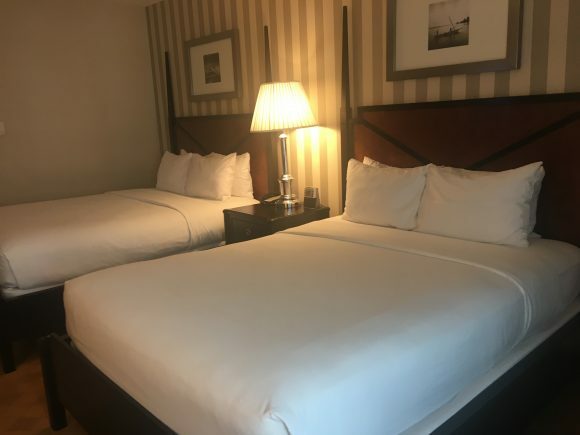 Not knowing much about the area or the hotel, we were nothing less than stunned by the beauty of the resort and the activity of National Harbor. Being just minutes from Washington D.C. was a draw and while this visit didn’t leave us time to explore the capital we knew we found something special in Maryland! The 19 story Gaylord National Resort glass atrium allows a full view of the Potomac River and the eye catching Capitol Wheel. From outside looking in, you see the 55 foot suspended tree and the illuminated stars. It’s so beautiful and there’s so much to look at you will take some time to get to your room! The resort opened in 2008. Our Gaylord National Resort standard hotel room with atrium view offered enough space for our family of four. When we entered, the flat screen television was on greeting us with information about the resort and its amenities and activities. The closet was a help for our winter coats and our suitcases could sit on the floor of the closet and out of the floor space. The bathroom had great amenities – razor, shave soap, toothpaste and a loofah along with the standard soap, shampoo and conditioner. I appreciated the hair dryer provided as it’s just always so big to have to pack! There is a tall dresser for unpacking and a desk with lamp along with a nightstand with a lamp. The two queen beds gave us a comfortable nights sleep. Since we planned for breakfast with Charlie Brown and Friends in the atrium, we didn’t need the coffeemaker but it was nice to have it included with the room. Gaylord National Resort standard hotel room is comfortable but the atrium view is stunning. Our fourth floor room was over the Pienza Marketplace and close to the Cirque Dreams Unwrapped show and A Christmas Wish show. Did I mention the view of the Potomac? We weren’t in our room much because we were enjoying the Christmas on the Potomac activities, but when we were, we spent most time on the balcony soaking in the sights. Gaylord National Resort parking: Overnight guests to the resort can choose self park for $30, or valet park for $49. We found plenty of self park spots and it was a covered walk to get to the lobby check in area. Dining at Gaylord National Resort: Inside the hotel are 2 restaurants, 2 bars, a coffee shop and the marketplace. You won’t be hungry! We had our Charlie Brown & Friends breakfast buffet Sunday morning and also had some take out lunch at the marketplace which was convenient for our hungry yet choosy children. The Gaylord National Resort is a convention center, and during our weekend stay there was a LOT going on. Families were enjoying Christmas on the Potomac but there were professional and social adult affairs as well. After the last A Christmas Wish show at 9 PM we headed to the room and I noticed it became a mostly adult atmosphere. We could hear music from our room from one of the ballrooms which didn’t prevent sleeping but did leave our kids questioning, “What’s going on? Can we go see?” Also for the adults is the Relache spa, which mom will be enjoying on our next visit. Everyone forgets something while packing right? Mom forgot socks and our daughter forgot a bathing suit. Given that, I was happy to see Amelia’s Boutique for me, located inside the resort. There are also souvenir shops and stores in the Christmas Village. No luck on a bathing suit but the Gaylord National Resort does have an indoor pool and hot tub with lifeguard. We didn’t get to enjoy it this time but we did play some games in the arcade just outside the pool area. 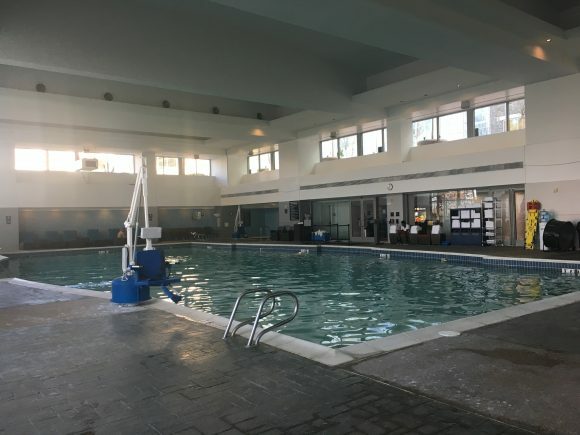 There’s a large fitness center as well. The resort does not allow pets or smoking. Internet access is included. Staying at the Gaylord National Resort puts you just steps from the bustling fun of National Harbor. 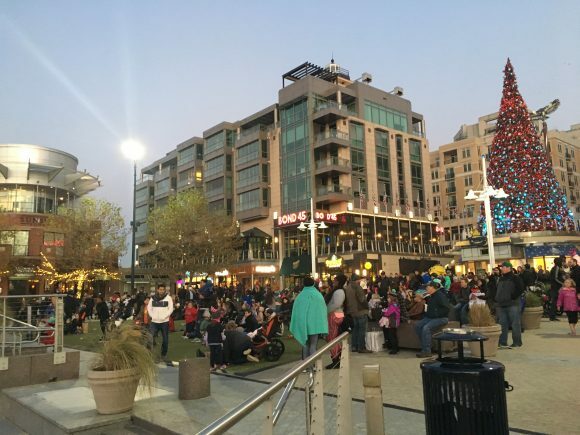 National Harbor was developed in the last 20 years as mixed use space along the river and it has become quite a destination. Accessible by shuttle bus (free to overnight guests of the Gaylord) is the Tanger Outlets and MGM casino/convention center. On a tip from a Gaylord Resort employee, we headed to the 180 foot tall Capitol Wheel at sunset and so glad that we did. We didn’t get in a car, which is heated thankfully, until the sun had set but we did get to ride the wheel while fireworks were set off on a nearby dock. What an experience! An outdoor holiday movie had just ended but kids played on a sand playground and adults enjoyed the firepits at Flight Deck at the Capital Wheel. There’s a carousel at the harbor also and so many restaurant options. With more than 40 we had no trouble getting a table and getting fed before heading back to the room. The walk is short and with the tree light show, sculptures on the sidewalks and overhead Christmas lights on the street we weren’t in a rush to get back inside. Surely the summer brings different but just as much fun to National Harbor. We can’t wait to check it out in the future! We returned home from our getaway with Christmas carols playing in our heads and some great family memories. Visit the Gaylord National Resort website for full details. For more photos see our Facebook album.